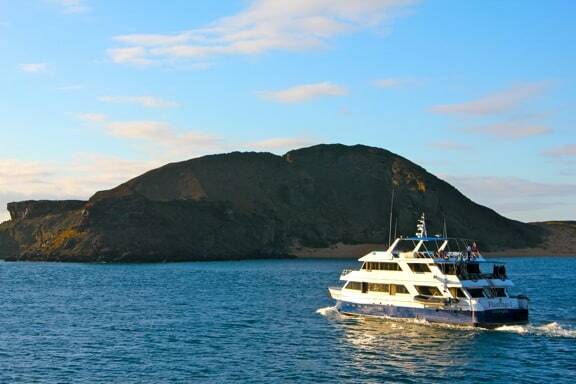 Our third afternoon in the Galapagos Islands began with the most incredible snorkeling trip of our lives, in Tagus Cove on the island of Isabela. 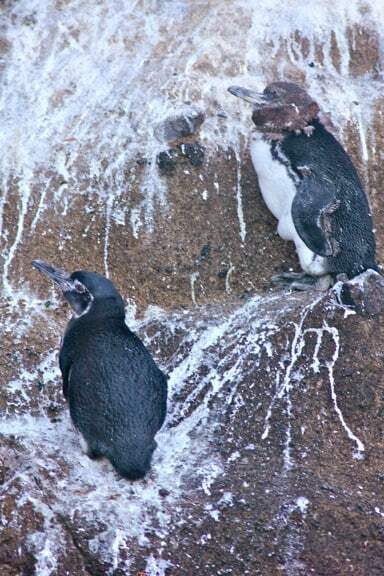 Even before we dove into the remarkably frigid waters, we saw Galapagos Penguins on the shore getting ready for a swim. I was able to capture this one in silhouette as he darted like a torpedo beneath the roiling waves. The penguins were incredibly cute, but they were far from our only exciting sighting. 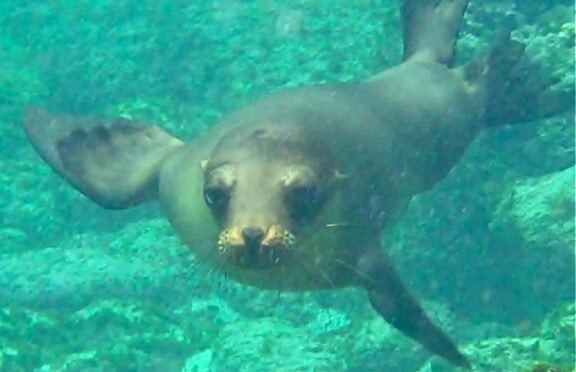 A playful Galapagos Sea Lion seemed eager to engage, and numerous Sea Turtles swam around munching on the jellyfish that seemed to float in the water like strands of confetti on New Year’s Eve. 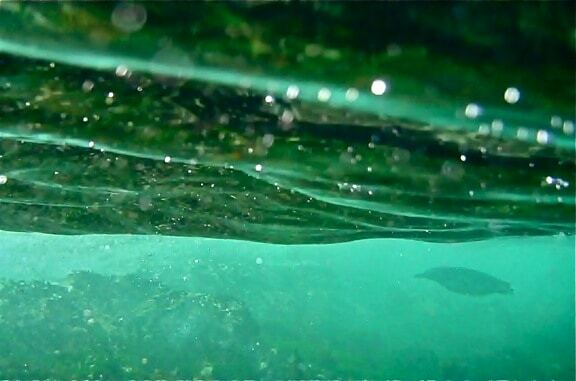 At one point I looked up from the video camera to find myself surrounded by Medusa Jellyfish: Shortly afterward, I decided I’d had enough snorkeling for the day! 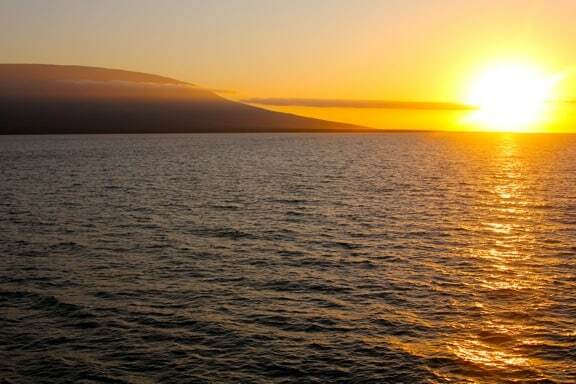 In what became a favorite routine, we ended our day on the upper deck of Ecoventura’s M/Y Eric, watching the picturesque sunset. After dinner, we could often be found there, bundled against the brisk wind, watching the stars go by as we made our way to the next island. Our fourth morning began with a wet landing at Puerto Egas on the island of Santiago. 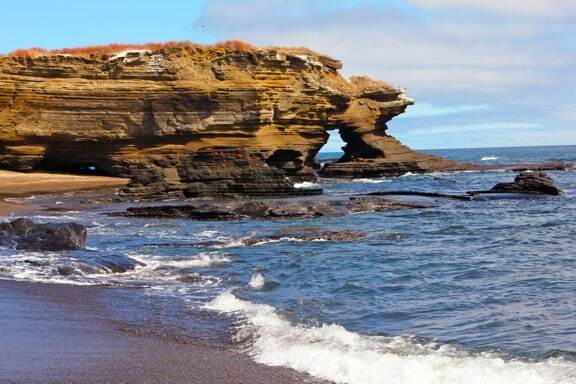 The beautiful rock formations at the shore offered a hint of the hike to come, where crazy-looking lava formations served as the home to a whole host of colorful wildlife. 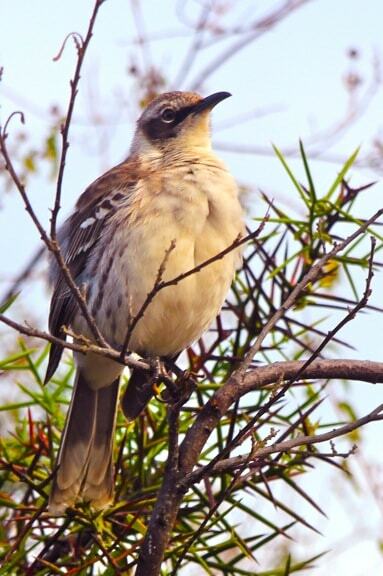 The Galapagos Mockingbird was one of our most frequent bird sightings, and their distinctive call could be heard on practically every island we visited. Much more aggressive than some of the area’s other avian species, the mockingbirds often seemed to prefer walking over flying, and at times reminded me of the Roadrunner. Beep Beep! 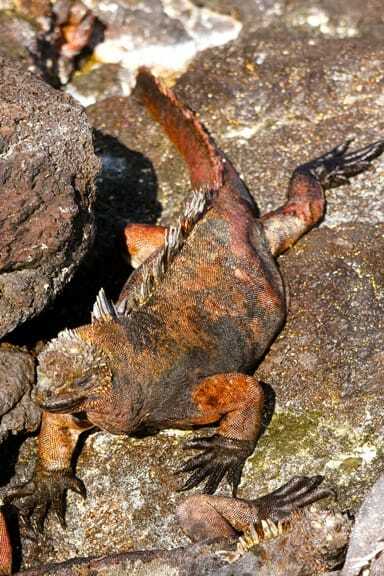 It may have been the famous Galapagos Finches that led to Charles Darwin’s Theory of Evolution, but for me it was the iguanas that really hammed home the concept. 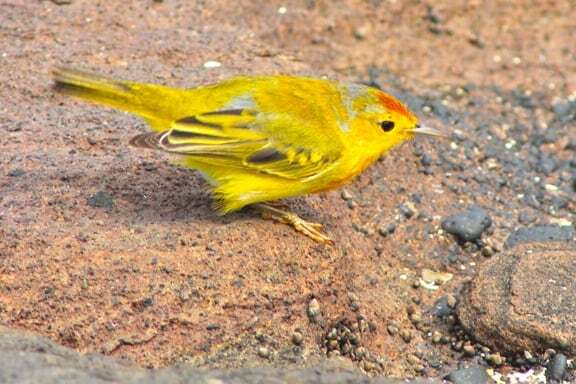 They were so different from island to island, with this fellow’s rust-colored highlights allowing him to blend in well among the lava rocks that surrounded a hole known as Darwin’s Toilet. 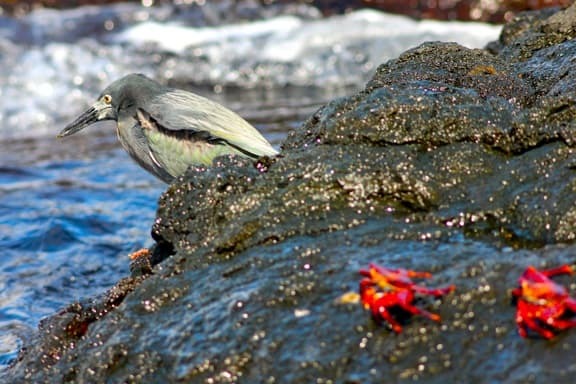 I can’t tell you exactly why I was so fascinated by this little Lava Heron, but I sat there photographing him hunting for fish along the Santiago Island shore long after the rest of my group had walked on. Maybe it was the green-tinged feathers, the yellow eyes, or simply the fact that those colorful Sally Lightfoot Crabs seemed so curious about what he was doing. 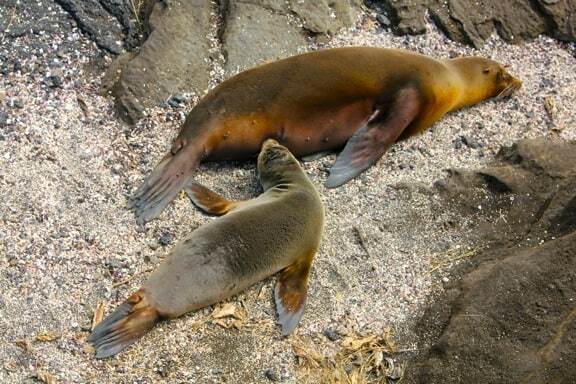 Last night I watched a Simpsons episode in which one character said, “Nobody can resist a baby seal.” The same could be said of Galapagos Sea Lions. Despite my rough ‘n’ tough exterior, I was reduced to a childlike “Awwwww!” pretty much every time we spotted a baby. Seeing them nursing? Cuteness overload! 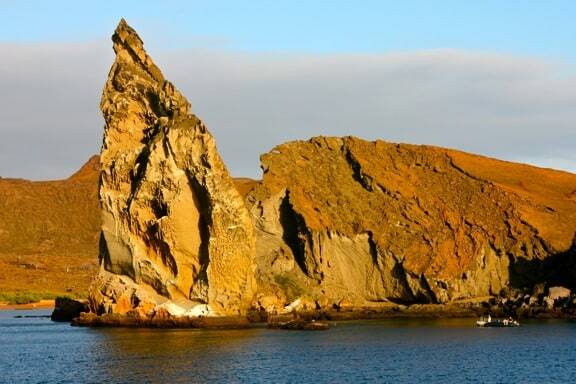 One of the coolest things about the Galapagos Islands is the opportunity to see so many wildlife species living in close proximity to one another, seemingly without much in the way of territorial disputes. 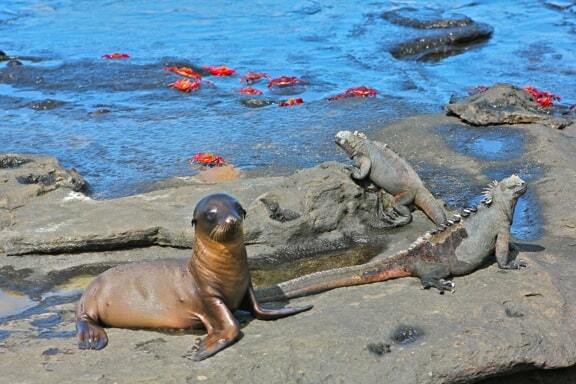 Here, we see another adorable baby sea lion, two Marine Iguanas and a gaggle of Sally Lightfoot Crabs. Add a bonfire and you’d have one helluva beach party! One of the best things about traveling with Ecoventura was the spirit of fun their crew created on board the ship. 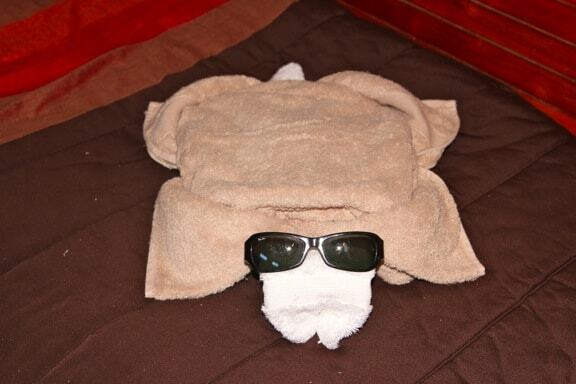 Almost every day when we returned from our adventures, we’d find these wacky towel critters, often shaped to look like an animal we’d just seen. Coming back from snorkeling with sea turtles, this cool little guy made us laugh, rocking Mary’s shades. For obvious reasons, I was never able to get a shot of the M/Y Eric, but loved this photo of Ecoventura’s Flamingo I. It was identical to our ship, with 1o passenger cabins, a great little dining room/bar/lounge area, and excellent sun decks that provided plenty of room for sightseeing, relaxing with a good book or, in a pinch, hanging up your laundry to dry.